Now the Kalasa pujai, archanai, ashtothra pujai and charadu pujai are performed by a sasthrigal(purohit) or by yourself. If you live in a place where you cannot invite a purohit you can do the puja yourself. puja CDs are easily available. Neivedyam is performed.(offering). 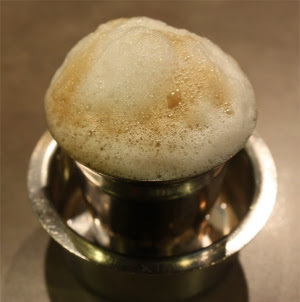 Madras Filter Coffee or kaapi is a sweet milky coffee made from dark roasted coffee beans (70%-80%) and chicory (20%-30%), especially popular in the southern states of Karnataka and Tamil Nadu. You'll need a traditional percolator which is made of 4 parts. 3. Strainer, although this looks like an umbrella it is a strainer. Assemble the filter, where the base is fixed with the percolator on the top. Once this is done place the strainer and then keep the lid ready. 2. fill up coffee powder in the filter. 6.Once the milk boils take your quantity of sugar in the tumbler pour some decoction and add the milk.you can adjust the quantity according to your taste whether you want it light or strong. 7.Mix it well by pouring it into the cup(dabaraa)to form a froth and enjoy the coffee. To the beaten buttermilk, add the rest of the ingredients and mix them well or else whip it once in a mixer for an enhanced flavor and taste. Tastes good when chilled. This is a refreshing drink. Grind both the ginger and coriander leaves together to a smooth paste and add it to the beaten or whipped buttermilk. Also add the salt and asafoetida and mix them well and serve chilled. Heat a drop of oil in a pan, add the seasonings and fry and add it to the beaten buttermilk along with salt. Serve chilled. To buttermilk, add pepper powder, sugar, salt, and whip or beat them well. To this, add the tender coconut water and serve chilled. This helps in cooling the body and also very good in minerals and gives us more energy. Beat thick curds, ice cubes, sugar, cardamom powder and salt altogether well and serve chilled. This should be prepared only at the time of serving. It should not be refrigerated for a long time. Varusha Pirappu, or Puthandu or Chithirai Vishu, is the Tamil New Year celebrated all around the world by Tamil people. 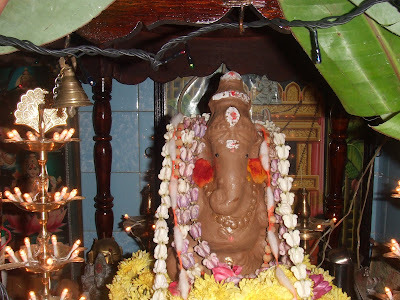 In 2011, Varusha Pirappu or Puthandu date is April 14, 2011. This is the first day in Tamil month of Chithirai masam in Khara year. As per Hinduism (Tamil beliefs), Chithirai Vishu is the day during which Lord Brahma started the creation. Many temples host special pujas during Puthandu in Tamil Nadu. Chithirai Vishu is also known as Chithirai 1 or Chithirai month 1. In Telugu New Year and Kannada New Year are celebrated as Ugadi on the first day in Chaitra month as per the respective calendars. Marathi New Year day is Gudhi Padva which is celebrated on the same day of Ugadi. Cheti Chand is the Sindhi New Year day which is the first day of Chaitra month. Malayalam New Year day is Vishu. Bengali New Year day is Baisakh or Poila Baisakh. Assamese New Year day is Bohag Bihu. We have VISHU and we will be preparing these recipes and shll tell you our custom. The festival is marked with offerings to the divine called Vishukanni. 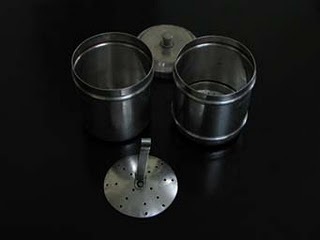 A lighted bell metal lamp called nilavilakku is also placed alongside. This arrangement is completed by the women of the house during the previous night. On the day of Vishu, it’s a custom to wake up at dawn and go to the puja room with the eyes closed so that the first thing a person sees is the Vishukanni. The Vishukanni is later distributed among the poor.People wear new clothes for the occasion and the elders in the family distribute tokens of money to the children, servants and tenants. These tokens are called Vishukkaineetam and are usually in the form of coins. People carry out this custom believing that in this way, their children would be blessed with prosperity in the future. 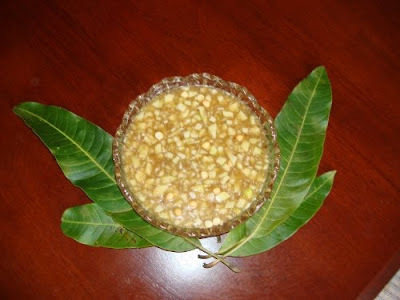 Vishu is considered to be a day of feasting, wherein the edibles consist of roughly equal proportions of salt, sweet, sour and bitter items.Feast items include Veppampoorasam (a bitter preparation of neem) and Mampazhapachadi (a sour mango soup). Clean the cut plantains in salt water ,drain and cook the plantains along with yam , turmeric and salt. Grind the coconut with cumin, green chillies and add to the cooked vegetables. Let it simmer. Meanwhile, heat the oil and pop the mustard seeds. Add the red chillies, sauté, add coconut and curry leaves reserved for garnish and stir till browned. Add this mixture to the erisserry and serve. Soak rice for 1 to 2 hours and grind to the consistency of dosa batter. Mix well by adding all the other ingredients and keep for half an hour. Heat the appa kuzhi and pour oil in each portion until it is half full. After oil is heated, pour a small amount of this batter into the oil in each portion. Turn over with the help of a ladle and cook until the appams are fried well, and become golden brown on both sides. Cook peas and keep aside. Slice all the vegetables into medium pieces. Coarsely grind the ingredients for the masala and keep aside. Cook bread fruit and plantain with sufficient water. When it is half done, add pumpkin, runner beans and salt. When it is done, add cooked peas, chilly powder, turmeric powder, ground masala and mix well. Before removing from fire, mix well by adding little coconut oil and few curry leaves. Wash and cut mango, green chilli into pieces; heat a pan with oil and do the seasoning; add raw mango pieces and fry for few seconds. Then add tamarind juice and some water; bring to boil and cook till mango pieces are soft. Now add jaggery and let it boil till jaggery dissolves; boil for few minutes; now mix rice flour in ¼ cup water and add in the pachadi. Stir, cook till it is thick and remove. Serve with rice or chappati as side dish. Use mango without peeling the skin. If mango is too sour, add some more jaggery and adjust consistency as per your need. ◦Finely chop the chakka chula(jackfruit) and keep it aside. ◦Mix the fried moong dhal, chopped chakka chula and rice and add required water and pressure cook it. ◦Melt jaggery in water and remove scum. Add the cooked rice, chakka chula and dhal mixture with jaggery. Add little water. ◦Let the jaggery boils well till its raw smell goes off. ◦When the rawsmell of jaggery goes away, add the last ground(2nd time) cocunut milk to the rice mixture and let it boil for a minute. When the mixture starts to bubble, add the first ground cocunut milk and cardamom powder and switch off the flame. ◦Heat a pan, add little ghee and add coconut bits and fry till it turns golden brown color. Add the gried coconut bits to chakka pradhaman.